While I thought the letter pencil grades (“HB”, etc.) were standard, I came across this lament about the end of the barely known EE grade. The web’s best site for researching issues like this is the always entertaining and informative Leadholder.com, which has many vintage drafting equipment catalogs online. It seems that in the 1930s, Staedtler’s line ended in 3B, ExB, ExExB. By the 1950s, the line had extended to 3B, 4B, 5B, 6B, ExB, ExExB. It is as if these grades had relative meanings. I take the “Ex” to be “Extra”. In the 1970s or eighties, the grades had become EB and EE. I know of a store that still has an old Staedtler display which shows these grades. And finally, sometime between that time and the present, EB and EE disappeared, with 7B and 8B appearing. The trail would appear to run cold – except that Staedtler is a huge global corporation. After my posts on the pencils of New Zealand and Australia, I found myself checking Staedtler’s many national sites, and noticed that they aren’t all just translations or localizations of the same content. And there it was on the site of Staedtler Thailand – the Staedtler Mars Lumograph 100, still produced in grade EE. So if you’re looking for this pencil, it’s not yet extinct – though it is on the endangered pencil list. Quickly testing it out, I can find no difference between it and the 8B. Something might be revealed by longer term use. It also doesn’t say where it’s made – most likely it’s origin is in Thailand. The Endangered Pencil list….ain’t that the truth. Film at eleven. If this guy comes through for me I could dump my lifetime supply of Ganske for Senate advertising pencils….they’re not very nice. However, prewar vintage advertising pencils are usually pretty nice stuff, and they’re not hard to find here. Farmers never threw anything away. it seems that the Staedtler Mars Lumograph 100 EB is indeed now an 8B. But the EE seems not quite the same as 7B, well it didn’t seem so a long time ago, don’t have one right now for experimentation. The E’s seem to have been discontinued a couple of years ago and they are my FAVOURITE pencils. Perhaps originally used for use on drafting film. 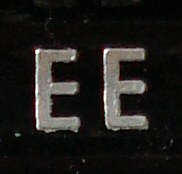 Between 1996 and 2001, “EB” was changed to “7B” and “EE” to “8B”. This was done in an effort to standardize the designations; “EB” and “EE” were not very well-known (e. g. Faber-Castell never had them) and didn’t fit into the Hx/Bx scheme. The formulae of the 7B/EB and 8B/EE pencils have not been changed (besides some minor changes that are applied to all grades now and then for optimisation etc.). – Source: Staedtler Germany. well i think they have changed. the 7B actually ‘blacker’ than the EB. But I have found some EE’s on ebay in a mixed box and today boxes of 12 EE’s. I’m happy….. EE’s are my favourite drawing tool. where can i get those pencil? I need to get ‘EE’ and ‘EB’. so, If u see my reply, u can send me a email. http://www.rsaum.co.uk is no longer available, so I still don’t know what the reason for removing EB and EE is. I have probably the only copy of a 2MM EB Lead refill in California, and I’d sell all I had to get that line back into production and distribution! They can be erased compleately with an electric eraser, and they don’t smudge or smear no matter how heavy a line you put on any kind of papaer if you can’t use a toxic fixative or a scanner! Is there some sora petition or boycott we could send to the company to get at least those leads back on the market? There is some more information here, though lead refills were not considered. I’m guessing based on comments that the EB and EE grades were once solely (or primarily) graphite based. well guess what i too am on the search for an EB pencil my favourite, gave my daughter my last one to use not thinking i would have so much difficulty finding another. So, just to clarify is it that the EB is now a 7B and is it up to the job? also is the 9B pencil even softer? I have a 20 year old set of “Staedtler Mars-Lumograph 100” pencils. The set contains the full range of B pencils AND includes an EE and an EB. I am a private Art Teacher at The Arts Emporium in NSW Australia, have completed Tertiary Art qualifications, have experience teaching in secondary schools and majored in drawing. I can categorically state that the EE and the EB are NOTHING like a 7B or an 8B. (they might be the same for the manufacturer but they are not the same for an Artist) The EE and EB are intense BLACK pencils which have nothing of the shine of a 7B or 8B. Infact – I would say that the EE and EB are closer to a black pencil such as a Derwent Ivory Black or even a Faber-Castell Black Watercolour pencil. The Black pencils give a closer blackness to the EB and EE but drag more due to their waxier consistency. Whatever Staedtler has done to adjust the formulae has changed the way the pencil behaves. If the true EE and EB are out there – I will be pleased to recommend them to our students. How does the EE compare to General’s Kimberly 9XXB? I’ve been using the 9XXB lately when I need very dark non-shiny blacks. Drag-wise it doesn’t feel waxy like a lumograph 8B, it feels more like charcoal, but without being ‘squeaky’ or brittle. I found a circa 1930s Staedtler Mars tin with 10 EX EXB pencils. They are unusual in the sense that they are thick and round like EF carbon pencils, in fact have a similar lead quality, but the most unusual thing is that the lead is flat like a carpenters pencil in a round body. I never seen anything like this before. Is this a rare pencil? I imagine this was manually sharpened too. I’ve just had an interesting conversation with a chap from the Leeds Life Drawing club (http://www.leedslifedrawing.com/) about the last lonely (and long discontinued) pack of Lumograph 200-EB leads I have on my dusty shelves. We couldn’t decide where the old EB grade fell compared to 7B, 8B etc, because our memories are too befuddled or don’t go back that far to remember with any certainty. I still have a number of the discontinued coloured 2mm Staedtler leads from the mists of time (my shop – Dinsdales – has been in the art & stationery trade for well over 100 years), but no EE I’m sad to say. Anyway – thanks for the info. All, thank you for the comments. The withdrawn soft grade Staedtler pencils seem to be a subject of ongoing interest. Liz, thank you for the comment. You suggest that the EB/EE pencils did once have a different formulation. But I also note that in Australia, Staedtler used to manufacture the Lumograph. Could the formula have varied from the German Lumograph? Jim, rectangular lead/chisel point pencils are indeed rare today, and have both utility and a lot of cachet as collectables. Graeme, It’s nice to hear of a shop having older stock on hand. It is the sort of place I dream of, and a good reason to visit independent retailers! Thanks for your comment. Personally I despise the EE pencil BUT it is alive and well and living in Thailand. The EE pencil is the only drawing medium used by students doing observation drawing but I really feel it is not suitable for this job due to its limited tonal range and its tendency to turn into a dirty mess when used buy inexperienced art students. EE will never die in Thailand. I’m an art student at an international school in Thailand (Shrewsbury International School Bangkok) and we use EE pencils for shading etc. I’ve been using them since I was little and they help to add tone and shape and shadow to objects, they intensify things. I just want you to know that EE pencil is made in Germany, it is stamped Made in Germany on the pencil. I discovered the lovely EE in Australia in late 1990s. It’s my number one drawing and rendering pencil. It works absolutely fantastically on French 300 gsm arches (hot press smooth surface) that is traditionally used for etching. But EE and this hot pressed arches are made in heaven! Being a charcoal major, I find EE is a versatile medium. It has the stiffness of 7B pencils but without the annoying shine of graphite and posses the tonal depth of compressed charcoal yet capable of precision of strokes! I tried 8B. The difference is that I can rub and smudge EE tones with a piece of soft tissue or cotton ball but 8E has less capacity to be smudged to spread the gradation. Although EE and 8B are very close but that subtle difference is important for tonal rendering. While in Singapore I simply couldn’t find it all art shops. But I found them in Bangkok! I am going to grab what I can get while in Bangkok! This is the 15th site ive found that wants the supposed rare EE ebony pencil. Did you guys ever think to look at places like Hobby Lobby or Michael’s both stores carry this pencil asking with being able to buy online. They are by no means rare or endangered. Been using them for 20 years and never had an issue finding them. BTW HL carries a wooded one but Michael’s carries wooded and woodless versions. I have an old SM Lumograph 100 E E , it is not anything like a 7B or an 8 B. I am searching on line to find some EEs, it is my favourite, it is a cross between a charcoal and wax cored pencil crayon, it is very dark, layers great,resists smudging,although it does smudge a little, it has a thick core but holds a sharp point and works super with a stump or tortillon. If you happen to find one, try it, you will be properly surprised and will join in the hunt for the holy grail of rendering apparatus. I have a pack of 12 EE and EB Made in Germany. Where did you find your ee . Michaels artist’s loft brand in Canada use to sell them and they no longer do. Where can I find woodless graphite ee pencils ?